Now I am sure I took the right decision when I rejected to head a delegation of my previous company for an IT cultural meet some years back. I was bang on target when I didn't endorsed the idea of being an ambassador if not the brand of my company. Never sure who might have taken what short of objection to share a dais with me or worse even dropping my name from the participants list. Thankfully I somehow managed to save myself from some embarrassment and for all those hypothetical characters who might not have fancied me being an ambassador for my company and sitting beside them, maligning their reputation, value and all together their existence. 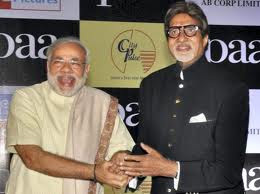 But Amitav Bachhan is not that lucky or should I say, not that foresighted like me to avoid such embarrassment. I struggle hard to find who is at the wrong end of the debate which is going on since the inauguration of the Bandra-Worli sea link last week. Is it AB or Gujurat or Modi or BJP or Congress or all of the above ? Can't get a better objective type question for sometime, I assure you. Some would say remove one of the options, either Modi or Gujurat, as according to them both are more or less the same. It all started with Maharastra CM refusing or objecting to share the same podium with AB on the occasion of the inauguration. More than AB he has a huge objection to AB's endorsement as ambassador of brand Gujurat, which Mr.Chief Minister thought otherwise as brand Modi. Is Gujurat untouchable or Modi? If the answer is the later then how does it matter to the CM if one odd Gujurati is untouchable. There could be so many Modis, Patels who could be termed untouchable socially for their act or action, whether proven or not doesn't matter. But the CM doesn't care about this simple logic it seems as he went ahead attending a literary function in Pune one day ahead of schedule, just to avoid sitting alongside AB. This act could be termed unethical, if I may say so. The least expected from a people's representative is to show respect to individuals, whether they have voted for him or not. Modi, in his blog vented his anger on all those who support Chauhan's philosophy by terming them as Talibans of modern day India and went ahead announcing the fiasco as insult to all the Gujuratis. How is that so Mr.Modi? Modi is not Gujurat or Vice-a-versa. So how does anyone objecting Modi concludes to be objecting the whole of Gujurat, along with the famous wild donkeys of the Ran of Kutch. Interestingly the congress party, whether they accept or not believe that Modi is synonym to Gujurat and the reverse. Or else why Mr.Chauhan object to AB's acceptance of promoting Gujurat's tourism has anything to do with who is the CM of Gujurat, even if he is as prominent a figure as Modi's. Even if we accept for once that Modi is Gujurat then even I don't see a problem or issue. Why Modi is so untouchable among the congress party? Is it because of the Godhra riots? or he being summoned by the SIT and asked to spend a better part of 10 hours, chit chatting with them on what happened some 8 years back? or is it because Tista Setelvad thinks so, whom the honorable supreme court snubbed with the harshest of languages for manufacturing false and parroted witnesses in Gujurat riots case? In the case of Gujurat at least 100 odd rioters fall to the bullets of the security personnel unlike 1984 where not a single soul was seen protecting the poor Shikhs. I am happy that I didn't had to hear the most absurd of statements "The earth shakes, when a big tree falls" after the riots, when I do feel the Train burning episode is equivalent to falling of a big tree. Keeping apart politics or individuals political gain, why AB is being sandwiched? Modi was correct in saying, in the same sense lets boycott Tata Nano, Amul Butter and Denim jeans. Shouldn't we? In the larger aspect it is more to do with vote bank politics than anything. Modi is keeping his cards close to his cheast and so as Chauhans alike. None is bothered about what happened in the Train burning and the thousands died after that, irrespective of who played a role to which extent. Latest being Abhisekh Bachhan dropped from the guests list at the recent earth hour celebration in Delhi where Ms.Sheela Dixit following footsteps of Chauhan did show little or no compassion for the larger issue of Go Green funda. I never knew this brand ambassador thing is hereditary. Father being an ambassador implies son being a victim also. Now I am double thankful that neither my father nor my grandfather ever endorsed anything or never being an ambassador the least. I am saved.